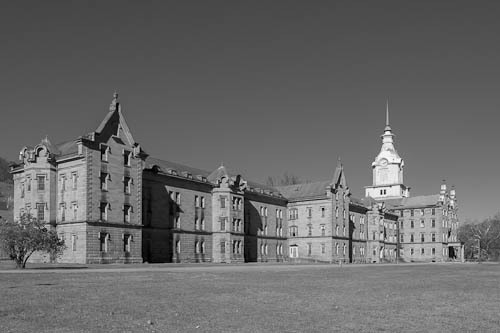 The subject of my upcoming exhibit, The Trans-Allegheny Lunatic Asylum is big. How big is it? The Kirkbride building is said to encompass nine acres of floorspace. It is reputed to be close to a quarter mile long. It is virtually impossible to capture the full extent of the Kirkbride building with a single image, except from the air. Satellite image from Bing Maps. The original southern ring is at the left end. 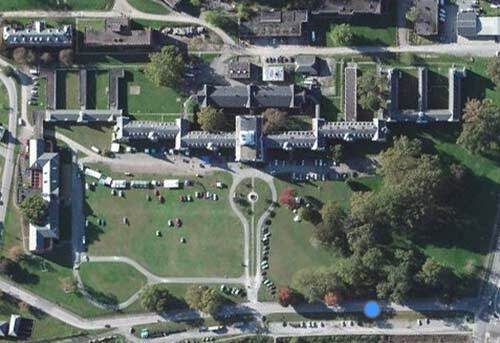 The satellite image from Bing Maps shows the full extent of the Kirkbride building as well as some of the surrounding structures in the complex. The staggered pavilions forming the shallow V are clearly seen, starting with the original southern wing that was first opened to patients in 1864. ~ by Admin2 on September 12, 2012. 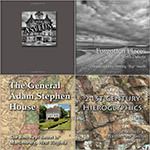 Looks like a fascinating project!